dressing like a bumblebee today, which is always a good thing. can't stop wearing these trousers, they're so comfortable and the colour still amazes me. i've also just bought them in 'cerise', which is so unlike me as i never buy 2 of anything, but i loved these ones so much, plus i knew they would fit. i'm a trouser convert. i was contacted by goldie london, which is a brand i really love (you've seen me wearing one of their sheer skirts recently), and they asked me to pick something from their website to wear. i'd been after a leather jacket for quite a while, but couldn't find one i really liked, but when i saw this one i was sold. ideally i was after a plain one instead of one with a studded collar, but i thought what the heck, this one is too nice to pass up. it's so soft, and will match with so many things. it's ideal! aw what a cute outfit!and i know i must have said this before,but girl,i just like your hair so badly!whoop! 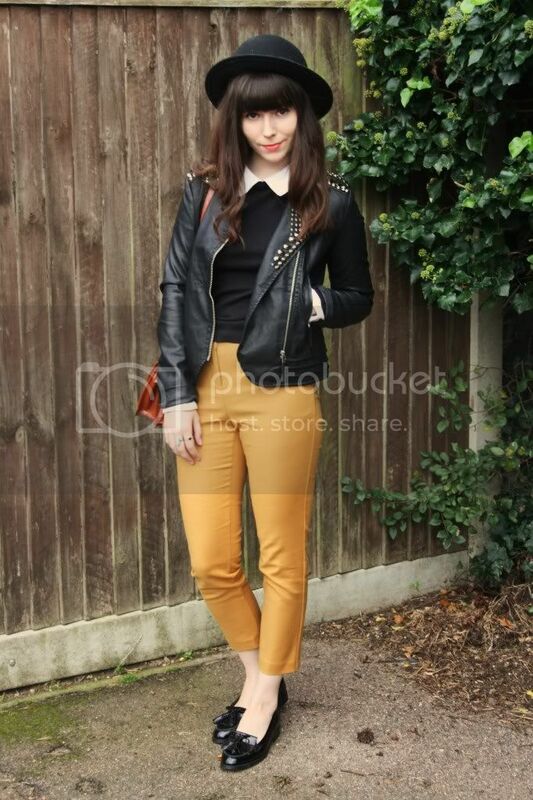 Those mustard hued trousers are so fun! So an edgy and pretty look. Love the pants! You have such a great unique style! You look adorable! I love the "bumblebee" colour combination and you look great in those pants! Love this look. Jacket adds the right amount of edge. You look gorgeous! I love the color of your pants, and the details on your leather jacket are perfect. I also adore the orange purse; it's so unexpected! You look really cool. I don't usually go for studs either but that jacket looks great. I love the studded leather jacket, definately need one in my wardrobe! Love those trousers, the colour is fantastic! Love everything about this outfit, & your hair looks wonderful too. Yes! This outfit is so perfect for fall. It's edgy in a very classy way, if that makes sense. I love the little white collar on your shirt and the jacket is fab. Indeed, the color of your pants are so vibrant. I just got a pair of bright blue jeans that have that same kind of punch, but I really like the length of yours. Great outfit lady. I love your pants! The color is just so beautiful! This is the perfect fall outfit! you look o lovely! I love the yellow jeans :D you pull them off so amazingly! I especially like your leather jacket! 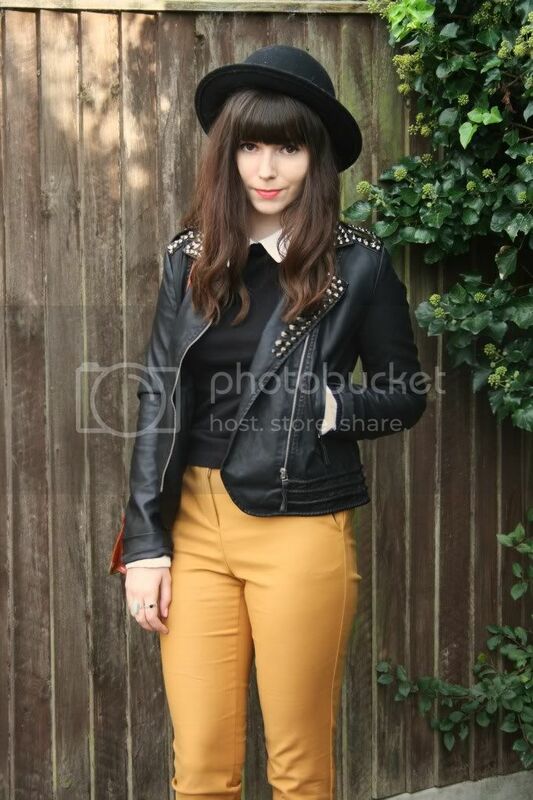 I think this is one of my favourite outfits you've wore.. Love the mustard trousers! keep on doing what you do, youre doing it ust right. omg, i love this outfit! you look amazing! this is super cute; i have the same pants but have rarely been brave enough to wear them. now i see how it's done! I love the leather jacket sooo cool! Your outfits always look so great! I think I might invest in a similar pair. I love this look! The jacket is amazing and I love that the rest of the outfit is so tailored. 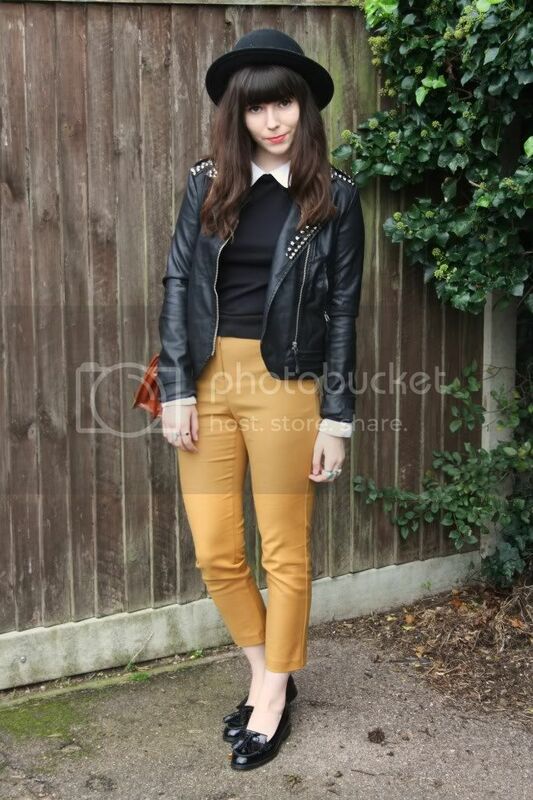 Love your mustard pants and that peter pan collar! I just found your blog. Sooo many great outfits. I just started following. 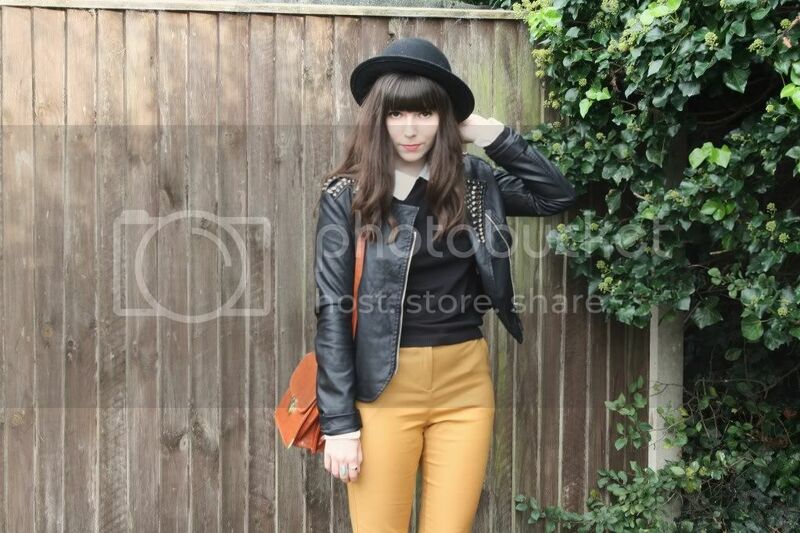 I'm loving these yellow trousers.